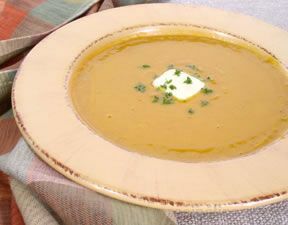 This creamy, pureed soup is the perfect starter course for a fall or winter meal. Peel and seed squash. 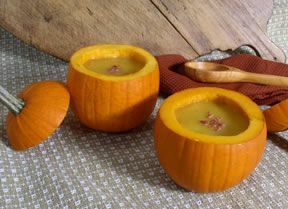 Cut squash into Â½" cubes. Chop onion, carrot, and celery. In sauce pan, sautÃ© chopped onion, carrot, and celery in butter until soft, but not browned. Add cubed squash and 4 cups of chicken broth, sage, salt, and pepper. Bring to a full boil. Reduce heat, and cover. Cook 40-45 minutes or until squash is tender. Season to taste. 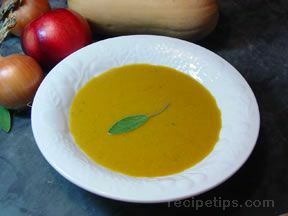 Pour ingredients into blender or food processor and pureÃ©. Add remaining 1 cup of broth. 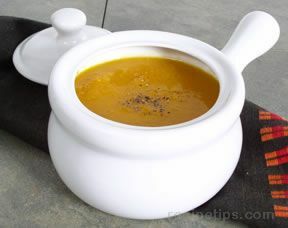 If soup mixture is too thick, thin with water or milk. Reheat and serve. Garnish as desired.